RowByte Plexus has been updated to v1.4.5. 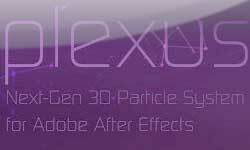 This update addresses Minor Bug Fixes, UI Tweaks and CS6 Compatibility. This is a free update for owners of Rowbyte Plexus. Just download the latest demo version and install.